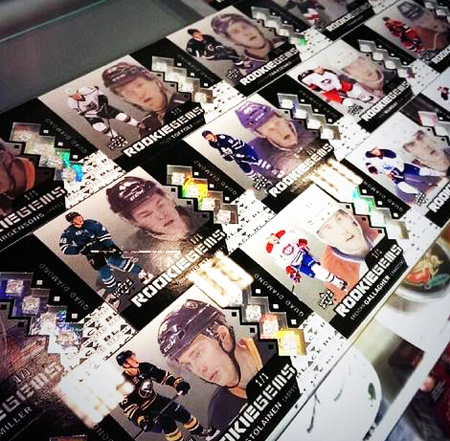 Upper Deck Innovates NHL® Cards and the Redemption Experience for Black Diamond Hockey! People often ask me, “What is the next big thing for trading cards?” It is incredibly difficult to constantly innovate a 2 ½” x 3 ½” piece of card stock, but time and time again Upper Deck has done it. We were founded on making a better trading card and that drive continues here today. So as we brainstormed, “What is the next big thing for Black Diamond Hockey?” we had a couple ideas that we put into place. The first thing we looked at was creating a super-premium, high-end driver for the set which we have done with the “Quad Diamond Rookie Gems Relics” trading cards. Now diamond cards have been tried before, but collectors have been, “ho-hum” about them as they have either contained small pieces of glass or even smaller diamonds. Long story short these cards were not much to look at and were all too readily available. They were not special. 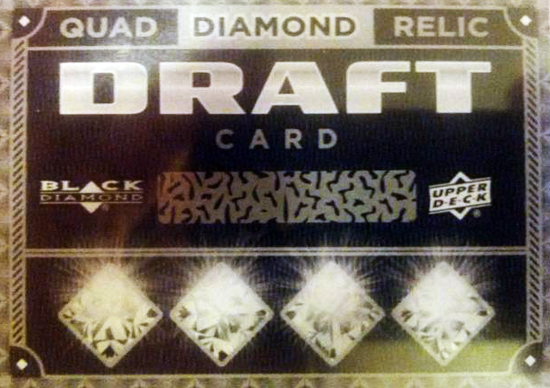 Upper Deck’s “Quad Diamond Rookie Gems Relics” cards were recently completed and suffice it to say, they are absolutely gorgeous with four huge one karat diamonds embedded in the trading card. They look like something that you would see in the men’s section of a really cool Tiffany’s. I was surprised we didn’t have a security guard watching over them. We debuted them at the 2014 Las Vegas Industry Summit and shop owners were in awe of the quality and beauty of these cards. Collectors who pull one of these redemptions can still score one of the diamond cards, only it would be at random from the remaining inventory. The purpose of the draft was to give collectors an opportunity to experience the product and scout which players they would want to select after a full hockey season. Fans who pull these cards after the event will receive a random card from the remaining stock. I wish… Those look spectacular! So awesome, only wish my LCS had the Black diamond in stock.